When in New York, Manhattan is the place to be! 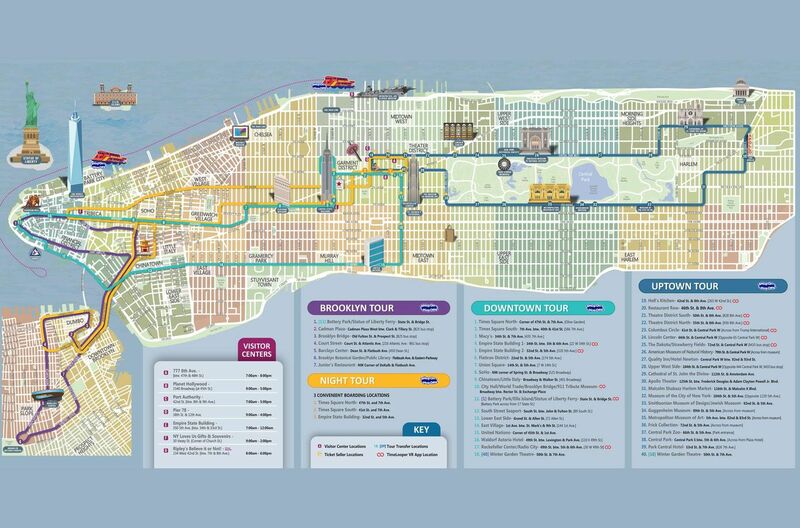 See the best of Manhattan with this Downtown New York Hop-On, Hop-Off bus ticket. The routes cover popular attractions like the Empire State Building, Greenwich Village, SoHo, Little Italy, South Street Seaport, Times Square, Rockefeller Plaza, Radio City, the United Nations, Fifth Avenue and many other attractions! Admire New York’s stunning skyline from the water and see iconic attractions on a scenic cruise with four hop-off locations in Manhattan and Brooklyn. You can hop off at the stops to explore Times Square, the Theater District, Wall Street, Brooklyn Bridge Park and many other attractions! The package also includes admissions to both the One World Observatory and 9/11 Tribute Centre. Admire panoramic views of New York from the 102nd floor of the One World Observatory. With its 360-degree views and three levels of innovative, immersive exhibits - the One World Observatory is an absolute must-do in NYC! Visit the nearby 9/11 Tribute Center, hear stories from the guides and learn about how the city got back on its feet in the aftermath of the terror attack. The hop-on, hop-off bus ticket is valid for 1 day. Downtown Hop-On, Hop-Off Tour: Buses run from 8:00am to 6:00pm, every 25-30 minutes. At 777 8th Avenue, between 47th and 48th Streets. City Sightseeing Hop-on, Hop-off Ferry: After voucher redemption, you can board from any of the stops. The Downtown New York Hop-On, Hop-Off bus cover all of Manhattan’s popular attractions. Hop on and off the bus and see the attractions of your choice. Frequent departures ensure that you never have to wait long for the next bus. Learn more about the attractions from the entertaining on-board commentary and the live English-speaking guide who is present throughout your journey. Admire a bird’s eye view of New York from the top of the tallest building in the Western Hemisphere. Enjoy an innovative & interactive experience at the new One World Observatory attraction with a ticket that’s part of this package. Experience the bustling crossroads of the world at the See Forever Theater. Engage with City Pulse and our global ambassadors as they share stories of this amazing city. Step onto the expansive Sky Portal and take a walk high above the streets of New York. There are a million things to see in New York and the only way you can savour it all is through a visit to the One World Observatory. The super-value package also includes admission to the 9/11 Tribute Centre. Visit the historic location of the dreaded terror attack that features a variety of exhibits to remember and honour those lives that were lost in the tragedy and those who selflessly fought to save lives. Redeem at the visitor center location listed on the voucher.